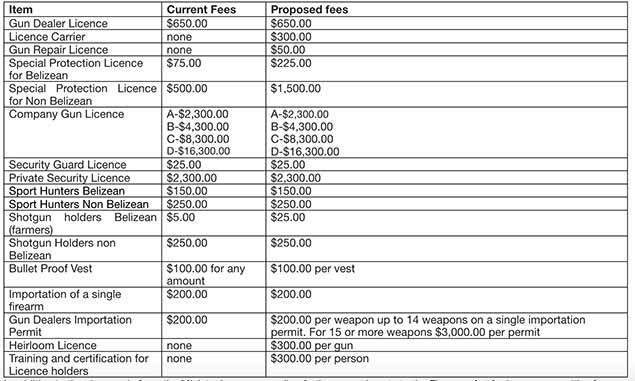 There's a proposed new schedule of gun license fees which was released today. A few notable areas are: it proposes to increase charges for gun licenses from zero dollars to 300 dollars, a gun repair license would also increase from zero dollars to 50 dollars, a special protection license for a Belizean would increase by 200% to 225 dollars, a shotgun holders license would increase from five dollars to 25 dollars. A press release from the Ministry says that in addition to the changes in fees, the Ministry is recommending further amendments to the Firearms Act to increase penalties for certain firearm related offences. Now, these are just proposed increases but they are coming into effect. A press release says, quote, "The new regiment comes into effect on a date to be announced." It adds that the new fees will be applied to subsequent renewal of licenses.There will no requirement for persons currently licensed to pay any increase until their subsequent renewal." If you are a holder of a firearm license, a gun dealers’ license or a sport Hunters Licenses then be informed that the fee to possess those licenses will increase. A notice was issued this afternoon in which the Ministry of Home Affairs and the Belize Police Department announced that the new fees will be applied to subsequent renewal of licenses. There will be no requirement for persons currently licensed to pay any increase until their subsequent renewal. Some of the fees will remain the same but those which will increase are the License Carrier which will increase from zero dollars to three hundred dollars. The gun repair license will increase from zero dollars to fifty dollars. The Special protection license for Belizean will increase from seventy five dollars to two hundred and twenty five dollars. The Special protection license for non Belizean is set to increase from five hundred dollars to one thousand five hundred dollars. Shot gun holders license for Belizeans will increase from five dollars to twenty five dollars. The gun dealers’ importation permit will increase from a general figure of two hundred dollars to two hundred dollars per weapon up to 14 weapons on a single importation permit. Fifteen or more weapons will cost three thousand dollars per permit. The heirloom license will increase from zero dollars to three hundred dollars per gun and the training and certification for license holders will increase from zero dollars to three hundred dollars per person. The Ministry says the increase in fees will be applied to the Belize Police Department in its fight against illegal Firearms and Ammunition. The Ministry if also recommending amendments to the Firearms Act for the increase of penalties for certain firearm related offences. Like this is really going to stop illegal guns? Just GOB grabbing more money!